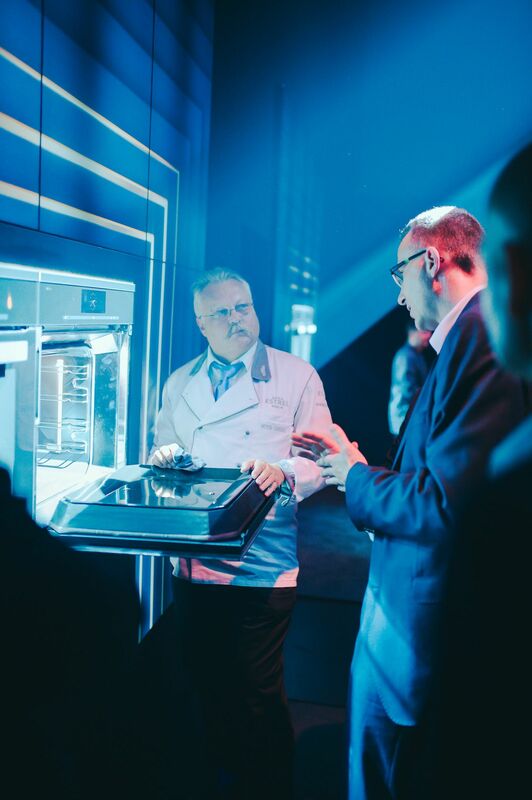 We travelled to Berlin to discover Miele’s new Dialog oven technology, which pioneers a new way of cooking resulting in a world of delicious possibilities. In a day and age when we can unlock a mobile phone with our face and ask Alexa to wake us up by playing “I’m Only Sleeping” by The Beatles, it seems surprising there hasn’t been a similarly ground-breaking innovation in cooking. Think about it, unless you’re a professional chef, making a beef Wellington or a chocolate soufflé still requires a lot of preparation and a prayer to the food gods for it to come out right. Sure, sous-vide machines and wireless thermometers have become commonplace but the science behind cooking has more or less remained the same. Whether it’s conduction, convection or the water bath that is sous vide, we usually heat—and therefore cook—food from the outside in. That all changes with Miele’s new Dialog oven technology, which is the first cooking tool that uses electromagnetic waves (yes, like a microwave) alongside conventional radiant heat to cook food uniformly. It’s named Dialog precisely because it “talks” to food—it’s in constant communication with what it is cooking, so much so you could put a frozen cake into the oven and it will defrost and bake it to perfection. That’s difficult to achieve using the current technology at hand; it would at least require one to monitor progress incessantly. For a product that revels in communication, everything leading up to the Miele event in Berlin last August was shrouded in secrecy. Contrary to a lot of other press events, no information was given except that they’re launching a cooking innovation and the hashtag was #revolutionaryexcellence. On the day itself, we were led to the beautiful Bolle Festsäle, a former dairy-processing factory turned cinema. The converted structure was a fitting platform for the Miele event. For one, the German brand’s first products included a cream separator and butter churner, and, like the adaptive reuse building, Miele’s radical technology is actually a clever reengineering of existing cooking machinery. The easiest way to understand Miele’s Dialog oven is that it’s a hybrid of a conventional oven and a microwave but infinitely more sophisticated. It cooks using electromagnetic waves at a low level of power and in a broad frequency spectrum. The key innovation is the way it communicates and adapts as it cooks—it continually measures the amount of energy absorbed and adjusts the settings accordingly. The first demonstration was the most mind-boggling one. A slice of cod fish in a box of ice was popped into the oven for eight minutes, and voila, the fish came out cooked but the ice didn’t melt. How did this happen? The Dialog oven is able to identify what it is meant to cook and target that specifically. Imagine this: cooking a Sunday roast in the future will only require putting everything in a roasting dish. You can leave it to the Dialog oven to cook the meat, potatoes and vegetables all at once perfectly. Apart from playing with temperatures, the Dialog oven is 70 per cent faster than everything in the market. Case in point: potatoes au gratin cooks in just 35 minutes, while the sumptuous yet time-consuming recipe of pulled pork takes only two hours and 20 minutes. That means you’ll have more time to fuss over craft cocktails for guests at your house party. With the Dialog oven’s MobileControl function, we’re this close to actually cooking with your smartphone. Gourmands can import recipe settings directly to the oven and, again, leave it to get the cooking done. Now, there’s really no need for ordering take away. Throughout the three-hour demonstration, the collective question was “What sorcery is this?” Even seeing it with our own eyes, the genius of the Dialog oven is hard to comprehend. What’s easy to see, however, is how it’s poised to make cooking (and life in general) easier, as well as more creative. Professional chefs were especially blown away. Chef Low says, “I can serve fish that is barely cooked but warm throughout (almost like a warm sashimi) and have fun with a tenderloin by cooking it medium in the middle and medium rare on the outside.” Imagine the culinary surprises that await us once experts like Low cook with the Dialog oven. Typically, hashtags are a hyperbole but in Miele’s case #revolutionaryexcellence is, well, apt. While it won’t be launched in Asia until 2019, suffice it to say, the future is here.